Monida Pass is a high mountain pass in the Rocky Mountains of the northwestern United States, at an elevation of 6820 ft (2079 m) above sea level on the Union Pacific Railroad and 6870 ft (2094 m) on adjacent Interstate 15. On the Continental Divide in the Bitterroot Range, it marks the transition between the Beaverhead Mountains and the Centennial Mountains. Its name is derived from the states that it separates, "Mon" from Montana and "-ida" from Idaho. 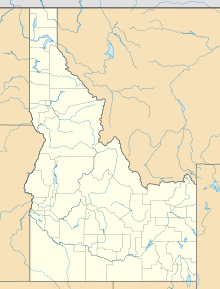 The pass forms part of the border between eastern Idaho and southwestern Montana, and is between the towns of Spencer in Clark County and Lima in Beaverhead County. On the Idaho side is Beaver Creek running through Beaver Canyon, Idaho, which was the route of the Utah and Northern Railway in 1880 and is still used by Union Pacific. Union Pacific once had an icemaking plant at Humphrey, Idaho, which is now a ghost town; Monida, Montana, which is near the top of the pass, is also almost a ghost town, as only seven people now live there. Its elevation is 6780 ft (2067 m), 90 ft (27 m) below the pass on I-15. In the late 19th century, stagecoaches ferried tourists from the railroad at Monida Pass to Yellowstone National Park, until UP built a branch line to the park over Reas Pass. Interstate 15, the "Veterans Memorial Highway," starts in Montana at the Idaho border at Monida Pass and runs north to the international boundary with Canada at Sweetgrass. ^ Idaho Museum of Natural History - Digital Atlas of Idaho - Rocks, Rails & Trails - Part 3, History of Eastern Idaho - "The Gold Road & the Coming of the Railroads," Page 54. Retrieved 4 March 2007. ^ Montana Code Annotated 2005 Archived 2007-02-16 at the Wayback Machine - 60-1-203. Veterans memorial highway. Retrieved 4 March 2007. Idaho: A Climbing Guide - 76. Retrieved 4 March 2007. USDA Forest Service - Beaverhead-Deerlodge National Forest - Cultural Resources at the Wayback Machine (archived January 14, 2009) - Historic Period at the Wayback Machine (archived January 18, 2009). Retrieved 4 March 2007. Idaho Museum of Natural History - Digital Atlas of Idaho - "A Brief Introduction to Idaho." Retrieved 4 March 2007.